In October this year the UN Human Rights Commissioner lamented that world leaders were suffering from refugee amnesia. Before, during and after the Second World War the world shut its doors on desperate refugees fleeing fascism and the Holocaust. Today governments are repeating the same mistakes as four million Syrian refugees flee bombs, civil war and persecution. The similarities between then and now are a product of capitalism. The system both breeds war and destruction on one end and then uses racism and border controls to keep people out at the other. There are several myths that surround the refugee crisis. First, that the ruling class simply did not know the scale of devastation in the Second World War as it unfolded, and that once they did, they generously and compassionately helped refugees. The second is the myth that governments learned humanitarian lessons from the period with the establishment of the 1951 Refugee Convention, designed to prevent the same thing happening again. When the Nazis came to power most countries of possible refuge already had strict immigration controls, often with the overt or tacit exclusion of Jews. Australia enforced this through the White Australia Policy. As Germany passed increasing numbers of racist laws, European governments were reluctant to take Jewish refugees. The US had already closed its borders in 1924. By 1938 around 450,000 of Germany’s 900,000-strong Jewish population had already fled. Germany’s annexation of Austria that year put a further 200,000 Jews under Nazi rule. By the late 1930s there were thousands of migration applications a week. The Australian government set a cap of 5000 Jews each year over three years. It argued that countries should only take as many refugees as they could assimilate, that they did not want to disturb living standards or racial harmony. The impasse culminated at an international conference in Evian in 1939. There 32 countries met to discuss the growing refugee crisis. Most cited their past generosity but said the economic situation could not permit higher intakes. Australia cited its White Australia Policy as a barrier to any non-British migrant group. The Australian official at Evian even claimed, “as we have no real racial problem, we are not desirous of importing one”. Evian was an abject failure. Only the Dominican Republic invited a significant number of refugees while the rest of the world agreed on keeping them out. The starkest example of the world’s disregard for refugees was the treatment of the St Louis in 1939. It is an example often cited by refugee supporters. 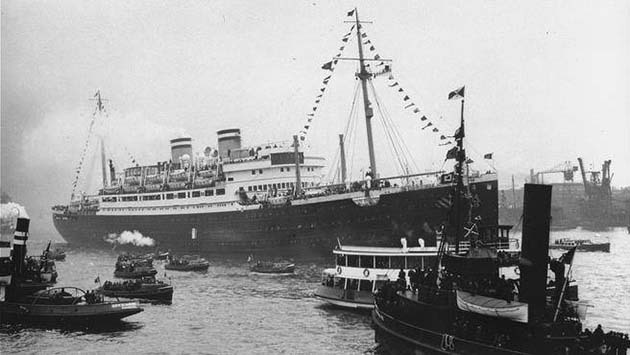 The boat left Hamburg full of 900 mostly German and Austrian refugees bound for Cuba. As they were on their way, the Cuban government changed its visa laws, turning them away upon arrival. The refugees attempted to get entry to the US, which left them languishing in the ocean. Roosevelt demanded they “await their turns on the waiting list”. We saw a similar situation earlier in 2015 when boats of mostly Rohingyan refugees from Burma were left to float and die in South-East Asia. Jewish relief organisations helped return the St Louis passengers to other European countries. Some went to Britain and survived. But of those who were taken to France, Belgium and the Netherlands, countries occupied by Germany during the war, only around half survived. The rest were murdered in Auschwitz and Sobibor. There is a myth that governments did not know the truth about the Holocaust early enough. Certainly, no one could have predicated in 1939 the scale of the mass murder that would take place. But the willful negligence at Evian was carried through the war years. We’re told today that the Second World War was a just war against fascism. But helping the victims of Nazism was at best a side issue, and often considered a hindrance to the Allies’ priorities. Indeed the Allies had aerial photographs and information from escapees about Auschwitz, but saw bombing the train tracks as a diversion from military operations. If they had bombed the train lines on the day in August 1944 when they flew within ten kilometers of them, the Allies could have saved a possible 150,000 people from death. The Allies’ opposition to the Nazis wasn’t based on opposition to racism or fascism. Britain and France were defensive about their land, markets and influence. The US wanted to re-organise the entire world around its military and economic hegemony. This was a war to determine which countries would control the world. There were at least ten million people displaced in Europe at the end of the war. Successive Prime Ministers have claimed Australia was generous following the war. Looking at raw numbers, this seems credible. Britain took only 2000 Holocaust survivors while Australia took 35,000. But this must be judged against the Australian ruling class’ goals at the time. There was bipartisan support for mass migration, but any humanitarianism was entirely incidental. Australia had a labour shortage and there were lingering fears about another war with Japan, so “populate or perish” became the post-war catch cry. The government shopped around for British and Western European migrants, and only reluctantly opened the doors to Eastern Europeans and Displaced Persons when they could not be found. Concentration camp survivors were specifically excluded, as were those with disabilities or mental illnesses and also southern Europeans, especially those from places with strong anti-fascist resistance movements like Italy and Spain. The idea that Australia entered the war to fight fascism again looks flimsy when it neither accepted victims of fascism nor those who had fought it. Jews could only make up a quarter of arrivals. Racial and political profiling persisted around the world. The US asked migrants if they were “Jewish by race and faith” or if they considered themselves socialists. Then as now, the Australian state (and all states) has always regulated migration and refugee intake through systematic exclusion, whether by handpicking Displaced Persons based on their capacity to work or through stopping asylum boats. Following the war there was a recognition among states that a better way of handling the resettlement of refugees was necessary. Until this time there was no legal recognition of “refugees”, their rights or the responsibility of countries that accepted them. The 1951 Refugee Convention codified these things. Australia argued against many of the key provisions in the convention from the start. The White Australia Policy was based on admitting individuals under racist restrictions, so Australia opposed any universal standards recognising refugee groups. It rejected non-discrimination sections because this might interfere with government policy forcing migrants to complete two years of indentured labour upon arrival. It opposed restricting deportations, since Australia routinely deported people. Australia signed the Convention late and opposed later attempts to extend its scope beyond dealing with Europe’s post-war refugees. Today we are facing the worst refugee crisis since the Second World War, and world leaders are using the very same rhetoric they did then to close the borders. Australian politicians again claim we don’t have enough resources to cope with large numbers of Syrian refugees, but Australia is a wealthy, developed country with plenty of space. We would have resources to spare if the government was willing to tax corporations. Just as they complained that Jewish refugees wouldn’t be able to assimilate, we now hear that Muslims can’t integrate and shouldn’t bring their sectarian problems with them from the Middle East. International leaders are again failing to act while the crisis unfolds. In Europe countries on the frontlines are erecting razor wire, walls and detention centers to keep refugees out. Meanwhile wealthy countries like Germany are halting their intake until other countries commit. In the wake of the Paris attacks Sweden and Poland are threatening to renege on their Syrian refugee intakes, despite the fact that the bombers were neither Syrian nor refugees. Holocaust Museums in the US, activist groups and journalists are all drawing parallels between the treatment of Jewish refugees then and Syrian refugees now. The best lessons we can draw are to stand against our own governments’ efforts to erect barriers and fences and manufacture the idea refugees are some kind of threat. While governments are bleating about threats to our way of life or a lack of resources, they are cutting social services and wasting money on bombs. We have a common fight alongside refugees against the system that bred such brutality and inertia in the Second World War and producing the same response today. Thanks. Would like to read more to how one way open borders and BDS from agreeing governments could work together against human rights denying nations.